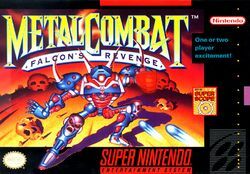 Metal Combat: Falcon's Revenge is the light gun shooter developed by Intelligent Systems and Nintendo R&D1, and was published by Nintendo. It is the sequel to the Super NES game Battle Clash, which also utilized the Super Scope and offers similar game play as its predecessor, but this time with two playable characters, longer levels, new weapons, training mode, multiplayer mode and a ranking system which increased the replay value. As the 21 century dawned and society ignored the warning signs of social unrest and tamperings with nature, crime, riots, and food shortages became commonplace. Cities soon dissolved into ruins and were divided and run as armed camps. As earthquakes and flooding devastated the remaining great cities, all seemed to be lost. In this world of anarchy, human life was filled with violence, hatred and hopelessness. Soon, the only source of amusement became the Battle Game. Advanced technology in weapons systems, armament and hydraulics were twisted to create a vehicle designed solely to compete in arena style combat. The first of these were little more than old army tanks outfitted with updated weapons systems. As pursuit of this new sport progressed, advanced designs with humanoid shapes soon began to appear. Originally called "Standing Tanks," they soon came to be simply called "ST." Typical combat between these metal monsters consisted of two STs facing off and firing their weapons at each other until only one was left standing. Victory meant power and prestige. Defeat meant that the loser would become a second-citizen, forced to served the victors. Not all accepted the Battle Game's class system. One young man, Mike Anderson, refused to live by the station being forced on him by his father's defeat in the Battle Game. Determined to seek vengeance on the fighter who had defeated his father, Mike dedicated his life to learning all he could about the technology of the STs. While Mike trained, Anubis, the fighter who had defeated his father, continued to win even more power fighting in his ST Thanatos. As he took control, Anubis promoted the best fighters in the Battle Game to be his "Chiefs." Along with this title, each was given control over a portion of the earth. Upon completion of his self imposed training, Mike undertook a most dangerous goal: to battle through Anubis' Chiefs and take on the one who had declared himself Emperor, Anubis. Three years have passed since Anubis suffered defeat at the hand of Mike Anderson. A new age of prosperity has begun to emerge and along with it, the rebirth of some of earth's great cities. Just as quickly as he disappeared following his defeat, Anubis has reappeared to resume his tyranny. Again you must join Mike and attempt to crush the iron rule of Anubis before he can once more throw earth back into the darkest of ages. A new playable ST, Tornado, which has to be unlocked. Training Mode, which is mandatory to complete if the game is played for the first time. Combat Mode, a two-players versus mode, in which the first player controls either the STs Falcon or Tornado, and the other one controls the STs Garam Mk2, Siamang, Wong, Griffin, Viscount, Thanatos and Arachnus via the standard SNES controller. The game uses a battery back-up, which saves any progress on Battle Mode, best times for any mode and overall rankings. The ability to charge shots more than one level in order to unleash a more powerful Energy Bolt. New special weapons, such as the Neutron Bomb. Also, it is possible to stock up to five standard bombs, which all of them only consume one space in the weapons slot. This game was the only one ever to use the OBC-1 chip. This page was last edited on 7 December 2010, at 08:32.